The convention: The one experience that every anime fan shouldn’t miss out on. Last year I was able to attend Otakon, but only for the last two hours, so I never really got the full convention experience until this year. I was lucky enough to be able to attend my home convention, AnimeNEXT, and I’m here to tell everyone about it. 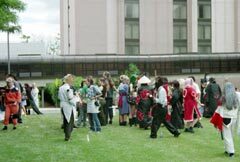 AnimeNEXT was held at the Meadowlands Exposition Convention Center with some additions events housed at the Embassy Suites and Holiday Inn, located right by the convention center. It was great, because everything was within practically a two minutes walk. There are also a number of hotels nearby making this a great location. What could be the most important thing about location is the fact that this is THE convention for anyone in the New York City Metro Area. For such a highly populated area, AnimeNEXT has huge potential for growth, because unless fans feel like driving roughly six hours to Boston or four hours to Baltimore, there is no other major convention in the area. I arrived Friday at 2:00 PM, and right from the start, it was a pleasant experience. The parking they had was right under the convention center, so once you step out of your car, you’re there. Upon entering, I was immediately greeted by a staff member asking if I was pre-registered or needed to register there, and was directed in the right area to go. They seemed to have an easy process for getting yourself into the event. The convention center itself was a nice size. 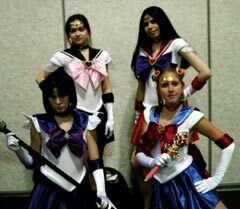 They were able to fit in one main theater, a large panel area, a medium sized panel area, and two smaller panel areas, as well as the dealers' room, two places for food, and a signing area into the center. Nothing was really cramped, and even Saturday, during the prime time, the whole center wasn’t a mad house of people, although the dealers' room could have benefited from some extra room. One of, if not the biggest problem that AnimeNEXT had last year was a lack of room, and they seemed to have done a nice job in correcting that for this year. Unfortunately, I think that AnimeNEXT might have a new big problem. The noise was bad, and it is quite easy to explain why. There were curtains, yes curtains dividing certain areas, and the smaller panels only had these thin walls that did not do a good job. Now I know they can’t just build soundproof walls, but hopefully they can come up with something. Oh and turn one of the speakers to face the panelist, so that they can actually hear the question. That would really help. Food was expensive, but that’s to be expected at something like this. I mean, no one thinks that they will get a hot dog and soda at a baseball game for two dollars, so you shouldn’t be thinking cheap food when going into a place such as this. Either bring your own or eat out, if you wish to save. Very first on my 'to do' list was checking out the dealers' room. As far as major companies being there, you had FUNimation (only there to advertise and to give away a few freebies), CPM, Media Blasters, and the website Anime Castle. When looking around you had your typical DVDs, CDs, manga, action figures, plushies, keychains, and varies other swag. They even had a few booths selling swords, and a booth with different kind of contact lenses. I picked up a CD at market value, and my brother grabbed a DVD at market value. Some booths had some nice deals going, but normally what they had wasn’t the best. You also saw a lot of pretty expensive stuff; it was normally a bit rarer. As all fans should be aware of, cons aren’t bootleg proof. I personally didn’t notice any, but it’s always something to keep in the back of your head when browsing the wares. Following the dealers' room, I had my sights set on my first panel, and that was the Anime News Network panel. It was a good panel, and we got to hear about some of ANN’s plans to expand their site and make it bigger and better than ever. The main focus, however, was on their new anime magazine, Protoculture Addicts. Christopher Macdonald gave out free copies to everyone there, and he talked about how the magazine is still new for them, and how they plan on making improvements in the near future. After looking through it, they are certainly off to a very nice start with it. From there, I was off to the ADR Script Writing panel. This was perhaps one of the most interesting panels, because I got to hear about the process of making the dub, and especially some of the problems they face in making the words match the movements of the mouth. One of the people on the panel was Toshi Yosihida, who is currently working on Inu-Yasha. In case anyone wants to know, they have currently dubbed up to episode 144, and he was waiting anxiously for the fourth movie, especially since the voice actor for Kikyo is moving. Let's all hope that they can do it without having to change voice actors. Following that was the American Animation panel. After about five minutes of that, I was ready to find something new. To cap off my night I sat in on perhaps one of the most unique and different things that I have ever witnessed. It was called Anime Parliament. Now for anyone unaware of what this is like (as I was), I’ll try to explain it. A group of people get together in a room and debate issues in a court-style manner, with one person residing over the proceedings. They would ask questions, such as did Celesti corrupt Belldandy when she was a minor, and then debate and come up with their own unique verdict. 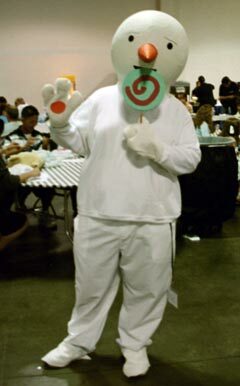 If you come in dressed up as a certain character, they want you to try and represent them. It was quite an experience, and although some fans might be shaking their heads at this, I’d recommend people go in and give it a try. 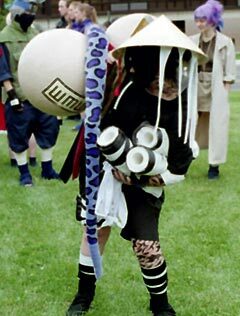 Heck, it’s an anime convention; you’re suppose to be taking part in stuff like this; that’s the point. Ah, the big day for any anime convention: Saturday! Here’s where the real meat and bones of any convention is. You get all the biggest panels, guests and events. 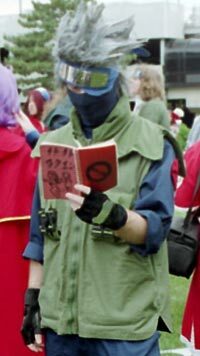 You must make an entire day out of Saturday during an anime convention. I started the day off here by hiding my pass, so that no one saw Animefringe on the front, then I walked into the FullMetal Alchemist voice actors panel. (I just wanted to be safe, in case someone was there who disagreed with Maria’s article.) They used the main theater for this one, and they got a good crowd in there, as you would suspect. 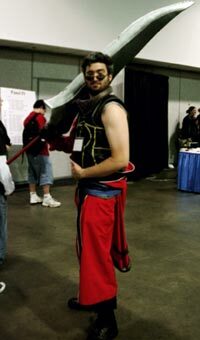 People love FullMetal Alchemist. The actors basically just answered some questions from the fans, made a few jokes, and it was a good time. Vic Mignogna was actually a pretty funny guy, and Travis Willingham and Vic played nicely off of each other. One of the coolest things was when a fan asked Caitlin Glass if she could sing a song with her, and she called the fan up on stage to actually sing it, right then and there. I thought seeing the interaction with the fans was great! Vic Mignogna also called up this one kid cosplaying as one of his favorite characters, and got pictures taken with him up on stage. It was certainly a very fan-friendly panel, which was great to see. Before all of the major industry panels started, I went over to check out the anime rooms in the Holiday Inn. They had four rooms dedicated to anime, as well as one for card gaming, a manga room, and a few others. The rooms were fairly large, and they played a nice variety of anime non-stop throughout the day, so I felt that AnimeNEXT did a good job here for anyone that just wanted to relax and watch a little anime. Next up on my busy Saturday was the 4kids panel. Here, I found Marc Diraison, Kerry Williams, Wayne Grayson, Mike Pollock, Ed Paul, and a surprise voice actor on the stage. Again, it was your typical, "What got you into voice acting?" and "Who’s your favorite character?" type questions, although I still just love seeing the voice actor say a line in the character's voice. There’s still something that I just love about seeing the actual person say it. Following that was the first of the industry panels with ADV. No big news was spilled here, although there was one big moment for me when I got to ask my first big industry panel question. I asked David Williams about the season one release of Gantz, and how he felt about the two episodes per DVD, but at a cheaper price format. His response was that people don’t like paying high prices for DVDs, so they tried to market it at a lower price. He said that Gantz sold very well, but he felt that it would have sold very well no matter what the release was for it. In conclusion, although Gantz still sold extremely well, it would have had to sold even better, since the production costs were higher, due to more volumes of the series being released. The odds are that it’s something we won’t see again. (Good call.) This left me feeling happy and intelligent, having asked a question that people wanted to hear and got a good response to it. David Williams did talk about something that I was very happy to hear. He mentioned how ADV is going to continue to focus on adding special extras with the initial release of DVDs, since they also come with a higher price tag. He mentioned how only thirty-one percent of people buy the initial release, and most just wait for the price to drop. As someone who normally buys the initial release, I’m happy to hear about the nice extras to help make it more worth it. After ADV was the second big industry panel, FUNimation. Now here is where some big news was actually dropped. FUNimation announced that they now have Speed Grapher. This certainly fits into their recent trend of all GONZO animes. Afterwards, I stopped Lance Heiskell and asked him if Trinty Blood might be in the near future for FUNimation, considering the GONZO kick that they are on. Although he didn’t say anything for certain, he certainly made it seem like this would happen and did not deny it. I made a stop-off at the Anime Insider panel, where they modeled off their new look for the magazine, which will be released once a month now, instead of bi-monthly. They also talked a little bit about some of the new sections you’ll be seeing. They passed a copy around, and as they put it, Anime Insider looks a lot cleaner now, and I feel they made some nice improvements. My day was over half-way over, but there were still more industry panels to attend. Perhaps one of the most pleasant surprises was the Media Blaster and CPM panel, which were the most fun industry panels of the entire convention. Media Blaster was hilarious and just refreshing to go to. I asked both the voice actor of Guts from Berserk and Media Blaster about the odds of ever seeing more Berserk. Both wanted to do more, would love the chance, would jump on the opportunity, and were extremely hopefully that there would be a second season of Berserk. So if the voice actor and company don’t know, I guess we can only join them in crossing our fingers. One thing is certain: the second that there is more, we will have it. I would have to say that CPM was probably the nicest panel of all. It was certainly smaller then ADV and FUNimation, but the people representing CPM just carried on a great dialogue with everyone in the room. They asked fans a lot of questions about what they want, what they like, and changes that need to be made, while keeping everything very entertaining. Now some might think this is just for show, but it wasn’t. In front of me I noticed this girl writing a lot down. At first, I thought she was Press. Then I asked her, and she was an intern writing down EVERY suggestion that the fans made, but they didn’t promote the fact that they were doing this. I even happen to read Peach Girl at the top of her paper, and just five minutes before, I had said that Peach Girl was one of my favorite animes not licensed yet. If anyone from CPM happens to read this, INCREDIBLE JOB!!! Perhaps one of my most anticipated panels followed CPM, and that was Adult Swim Revolution. Let's just say it was also the most disappointing panel. However, I wasn’t completely shocked after seeing that the guy from the American Animation panel was the same one who did Adult Swim Revolution. Well, this concluded my day of panels, and before I left, I just peeked in on Otaku Idol and the dance that was going on. I’ve got to say that one of the most enjoyable things about this convention and probably everyone other one out there is how much everyone there gets into it. The fans there love these three days and they make sure to enjoy it as best as they can. Other fans out there should take note of this. If you haven’t been, you should go to one. One in three people (at least) is cosplaying. You will meet people in the industry, you will get free stuff, and just get to talk anime with other fanatics. 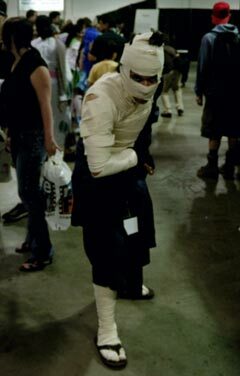 AnimeNEXT was a great convention, and I’m already looking forward to next year.